If the Buddha was driving in heavy urban traffic, would he honk? Much as that sounds like some wisecracking riddle, it’s a thought that occurred to me while my taxi’s driver was navigating the maelstrom of traffic in Yangon, Myanmar. Yangon has over five million people, and at times during my days in the city, it seemed that most of them were behind the wheel. Yet, though traffic surged, darted and inched, drivers seemed patient, and honks—if you can discern the intent behind a honk—seemed polite. I attribute that to Buddha. 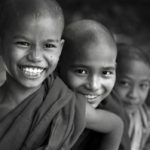 The majority of Burmese are Buddhists, and whether you dub Buddhism a religion, a philosophy or a mindset, its fundamental tenets of love, compassion and nonviolence seem to be woven into the people’s lifestyles. 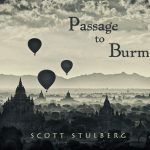 Besides the welcoming, benign and often humorous nature of the Burmese people I experienced all over the country, there were the dramatic and often spectacular physical expressions of Buddhism’s integration with the culture: the pagodas, shrines and temples that are everywhere. 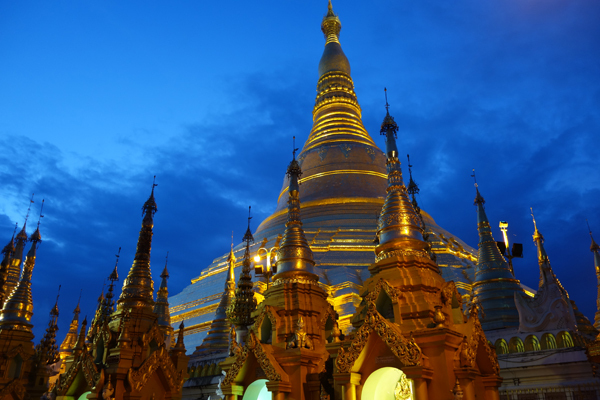 In Yangon itself, the Schwedagon Pagoda is an extraordinary complex of pagodas, massive and modest, small shrines and places of worship and contemplation—and teeming life. When I visited as part of a media tour with Trafalgar, the open-air grounds were filled with international visitors, tourists, monks and pilgrims. There are a wide number of small halls and rooms with statues of Buddha in his various aspects, where visitors pay their respects. But there isn’t the silence of a church here: there is laughter, darting children, and of course, many opportunities for cellphone captures. But your mind might be silenced by the sight of the main pagoda: it’s 326 feet tall. And as gleamingly gold as gold can be. In an area of arresting sights, this one handcuffs you. The fact that its original construction was in 600 BC is a tidy little tidbit too: Buddhism, which made its way to the former Burma via India, has had centuries to ferment and age. 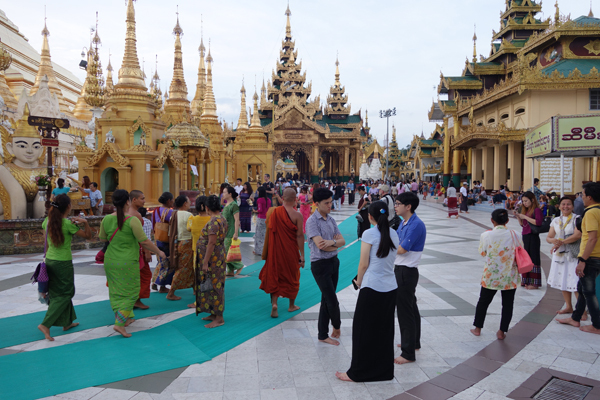 The Schwedagon Pagoda has aged very well. Being an old Catholic (one who wore the same uniform to school for eight years), I felt fairly comfortable in the monastic school we visited. These schools give kids, often poor ones, training in the general educational disciplines, as well as in spiritual ones. It was good fun try and talk with them a bit in class (my Burmese is notably poor) and to dispense the notebooks, pens and other supplies donated by Trafalgar to the lined-up students. Some were so shy, some so gleeful to get them, but there was good feeling all around. Our group moved to Bagan, where a mere 2,200 pagodas of various import dot the city’s environs. 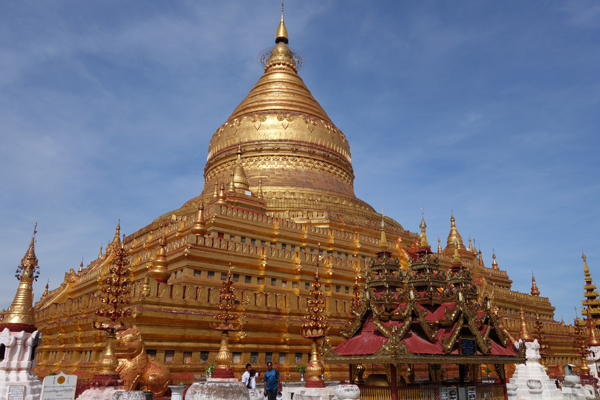 One of the most venerable and spiritually significant of these is the Shwezigon Pagoda, though having been built in the early 11th century, it’s an upstart compared to Schwedagon. The Shwezigon complex isn’t as extensive, but it too has many outbuildings, stupas and smaller shrines, with Buddha imagery and statuary. One of the charms of Myanmar’s Buddhism is that it’s mingled with some animistic beliefs that go way, way back, such as the belief in nats. Nats are spirits, some benevolent, some not, that can hold dominion over places or things. 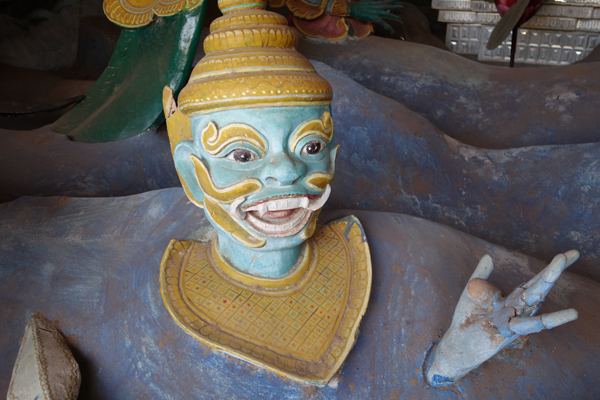 So, many of the pagoda areas will also have enclosures—sometimes decorated with paper money offerings for nat soothing—with figurative statues of the nats, as was the case here at Shwezigon. 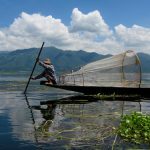 One of the more fascinating examples of pagodas in bloom was off of Inle Lake, east of Bagan. 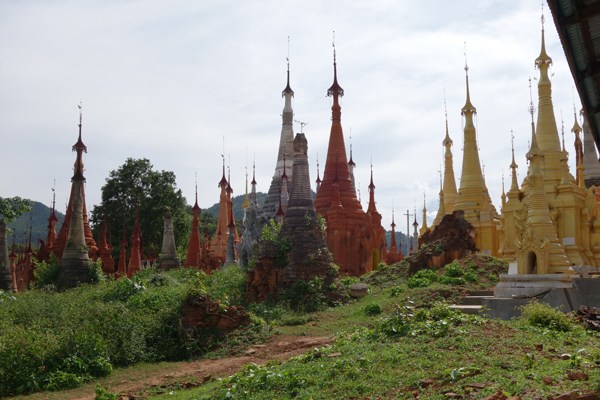 There are clusters of varying-sized pagodas at Nyaung Ohak, dating from the 14th to the 18th centuries. Many were crumbling, but were remarkably picturesque, and some had Buddha statuary in small enclosures. Continuing up the hill—it’s almost like the Arlington National Cemetery of pagodas—you come to areas where the structures have been restored, often with signs revealing which local community member or family has undertaken the refurbishing. As our Burmese guide, Nyein Moe (about as charming and warm a fellow as any planet has ever created) explained, the upkeep of many of the country’s shrines is undertaken (and underwritten) by local people, as part of their spiritual dedication. It’s clear that the dedication is strong, as seen by the care by which devotees applied the squares of paper-thin gold leaves to Buddhist statuary at the Phaung Daw Oo Pagoda, the holiest religious site in the Inle Lake area. These are the regular folks, in a poor country, giving lots from the little they have. That intrepid scribe Kipling never made it to Mandalay, but we did. 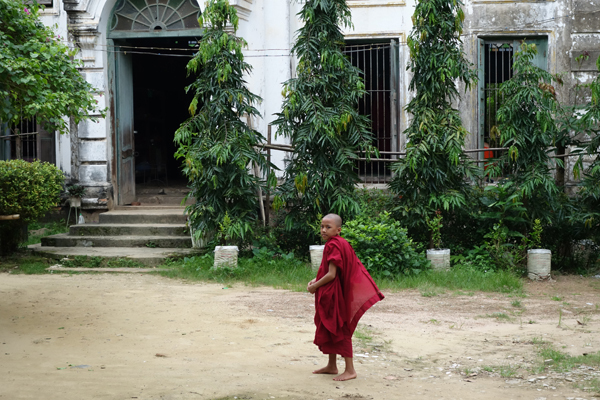 In a country with 500,000 monks, Mandalay has around 200,000 of them. But don’t forget the nuns. Though Buddha’s original precepts didn’t accommodate formal spiritual training for women, 19th-century Mandalay did welcome their work. 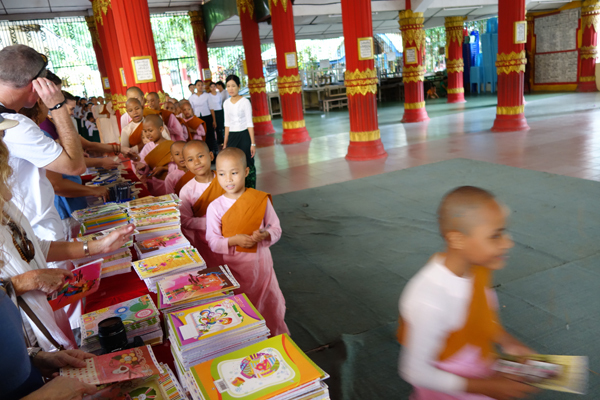 We visited a Mandalay nunnery that was established in 1989, with 170 nuns who take varying levels of exams to move up the spiritual ladder. 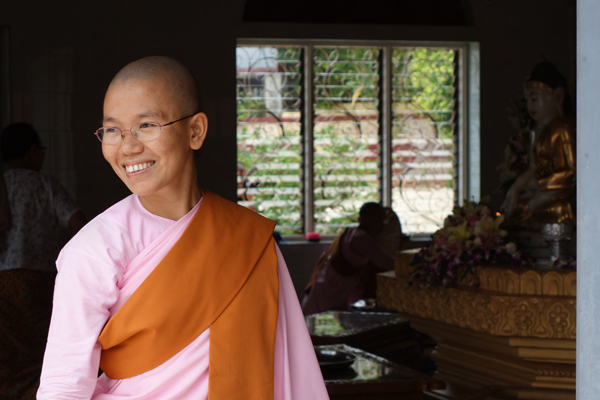 One interesting side note of the monastic life: monks can move in and out of the calling, returning to ordinary life out of the monasteries, as can the nuns, without the move being considered a religious failing. And they can also return to formal spiritual study. The monastic schools are known to give some of the best education in the country, and accomplished exam success would imply that the scholar would then be a monk or nun for life. But perhaps not. Delight it was to serve the nuns rice from large bowls to their smaller ones, and then to dine with them in a large hall. 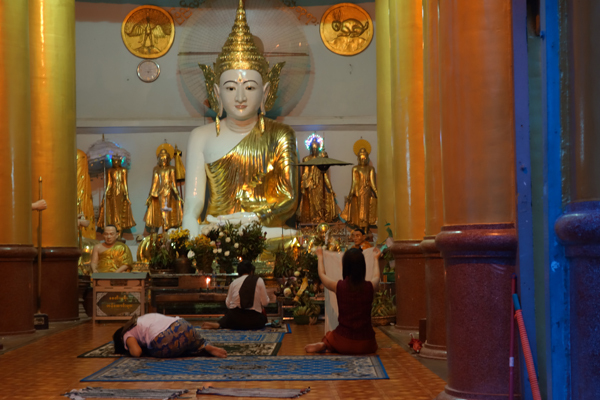 Part of our visit gave us the chance to see and hear some devotional chanting in front of a Buddha statue and to tour some of the nunnery grounds. I didn’t see any of the teaching nuns carrying the large pointers with which I was occasionally whacked when I was a mouthy child in Catholic school. 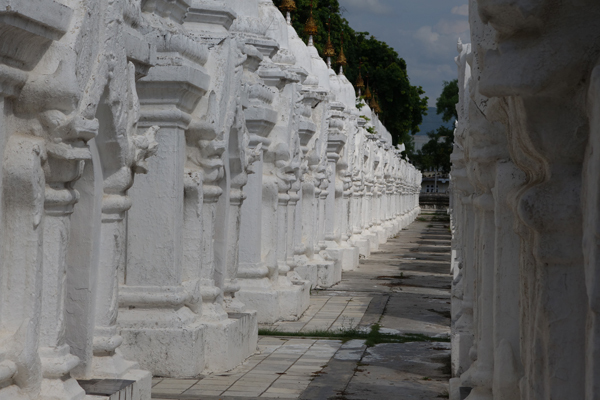 One of our last visits to a Myanmar spiritual center was to Kuthodaw Pagoda in Mandalay, where it’s impossible not to witness one of its most imposing attractions: the 729 marble slabs upon which are inscribed Theravada (one of the main arms of Buddhism) Buddhist scriptures. It’s easy to see why this has been dubbed the “world’s largest book”—It would take a Kindle as big as the Schwedagon Pagoda to house that bulk of spiritual literature. Our Trafalgar trip took us to many other venues and excursions that had nothing to do with pagodas or shrines, and I’ll write about those elsewhere. And as striking and awe-inspiring (in the old sense of the word) that these churchly edifices were, I want to return to my original question: Buddha behind the wheel. My thought is that the Burmese would see their faith’s guide long before he needed to do any honking, and clear paths would open for him. But as the teachings imply, we all have Buddha nature, so the good-natured Burmese also let all their fellows make their way in traffic as well. And a little honking never hurt. Delightful turn of phrase, Tom. As a peacemaking kind of guy, I find the idea of calm, relaxed drivers enticing. Nicely done, sir. Very good article, Tom. We enjoyed it very much along with the pictures. We had a fantastic trip to Myanmar from our home base in Penang, Malaysia when we lived there in 2013. Our guides for the 3-weeks we traveled the nation were great. We love the culture, food and especially the friendly people. Maybe, ‘The Lady,’ will make a huge turn-around for Myanmar if she’s allowed to compete for the top job held by a former military guy and his cohorts who took off their uniform and put on a suit. If that happens – we’ll be back. Joel, I was truly fascinated (and occasionally riveted in terror) to drive on the teeming streets of Yangon, where I wasn’t able to explain how multiple lanes from multiple directions flowed in and out of one another, and street vendors selling all kinds of things moved in and out of the traffic alongside the cars, as well as pedestrians and bicyclists (and occasional animals too). It makes LA traffic look calm. But it all seemed to work. Of course, out in the villages, it was much easier to cut in front of a bullock pulling a cart. Michael, I felt (and appreciated) the warmth of the people as well. We were treated and greeted all over the country, in places high and low, with kindness. I hope the best for the coming elections as well—the regular people have had some true misery befall them courtesy of the military government; deep change would be welcome, according to all of the Burmese we talked to. Tom – thanks for this nice post – I hope to visit Myanmar again later this year when we are in Thailand, this time for a longer stretch 🙂 I remember the gleaming gold temples well. Dave, my pleasure! Always good to write for you. And golden—dazzlingly so—much of that country is. Enjoyable to read, Tom, and your pictures are lovely. Hey Nancy, glad you liked it. Even knowing I was there (and sweating), it still seems like a fantasy. 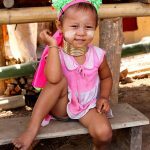 Tom – I’ve heard there are vineyards and some wines being produced in Mynamar. Did you have a chance to try some? Fabulous article, Tom; and equally fabulous photos! 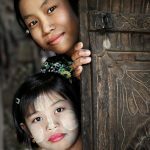 You paint a vivid and compelling picture of a fascinating culture. Nice job! Dave, there is a Red Mountain Estates winery near Inle Lake, and we were offered a tour as one of the side trips, but it was at the end of the day, when I was bleary-eyed, so I didn’t go. A couple of our group went, and said it was fun, though their thoughts on the wine were indifferent. Now I wish I had gone—it’s a great side story for an article. Hey Cindy, thanks for checking it out!